We love to root for the underdog, and that’s part of why we’re drawn to the stories of revolutionaries. Whether they fail, succeed, or succeed only to become what they once fought against, people who can rally others to their cause and shake up the status quo tend to be inherently interesting. 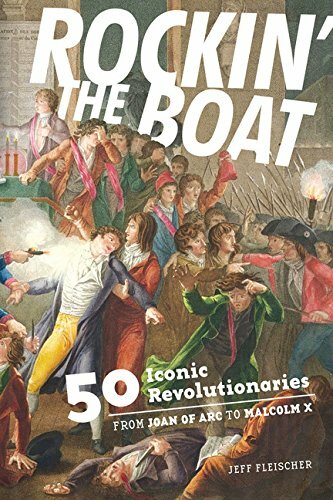 This tells the stories of 50 such legends throughout the world, from people fed up with the Roman Empire, to the revolutionaries who helped create America. Zest Books, the publisher of Rockin’ the Boat, kicked off the publicity tour with this interview. Write All the Words, a book blog by E. Kristin Anderson, asks all authors the same set of questions, ending with one unique to the book. LitPick, after giving the book a five-star review, included it as an entry in its Six Minutes with an Author interview series. In Bed with Books had a short interview not long after the book was released.